We’ve a packed couple of days with Arayot! 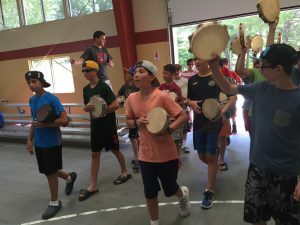 On Friday the first Shabbat of the session rolled in, and after the chaos of the first two days, a sense of calm fell over camp . We welcomed the Shabbat with our Kabbalat Shabbat (Friday night prayer) services. We davened (prayed) outside at the beautiful Gilboa (amphitheatre), where, despite forecasts of rain, the ruach (spirit) managed to keep every drop of rain away until we sat down for dinner together in the Cheder Ochel (dining hall). After dinner, we sang zemirot (songs) in the Ben Tzvi. For the first time, Arayot got to stay with the older kids for the high energy zemirot that Kerem (oldest age group) leads every Friday night. They were excited and happy to be included with the older chanichim. After a restful Shabbat, we jumped right into Yom Debbie (Debbie Day) to celebrate Debbie’s last year as Rosh Machaneh (head of camp). Our celebration began with a parade that everyone in camp participated in. Each aydah (age group) chose a theme to dress up as and Arayot’s was fruit! The chanichim (campers ) wore t-shirts that they made in Omanut (art) with drawings of different fruit on them. They also carried a giant stuffed banana over the crowd. We danced to music and sang karaoke. After, at the dedication ceremony of the Torah written in Debbie’s honor, the Arayot banim (boys) performed a drum song for all of camp and its guests. We finished the night with a delicious barbecue, singing Yom Huledet Sameach (Happy Birthday) to Yoni S and presenting him with a delicious cake. After singing along with and dancing to the Yavneh band, we watched the camp’s July 4th fireworks show (One day early) and then headed back to the bunks to go to sleep. The chanichim were exhausted and ready for bed, but were excited and happy that they’d had such a fun day!